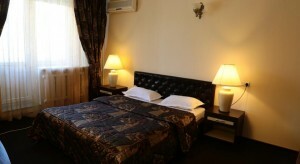 This hotel is in Almaty, just over 2.5 miles from the center of the city. The Central State Museum of the Republic of Kazakhstan is a 15-minute walk away, and free Wi-Fi is available throughout the hotel. All of the air-conditioned rooms and suites at Salem on Samal include a flat-screen TV and a minibar. Each has a private bathroom with bathrobes and a shower. Breakfast is served each day in the dining room. A number of restaurants serving a range of local and international cuisine can be found within a 5-minute drive of the property. The Samal bus stop and the Ramstor markets are both less than a 10-minute walk away. Almaty International Airport is 11 miles from the Salem.